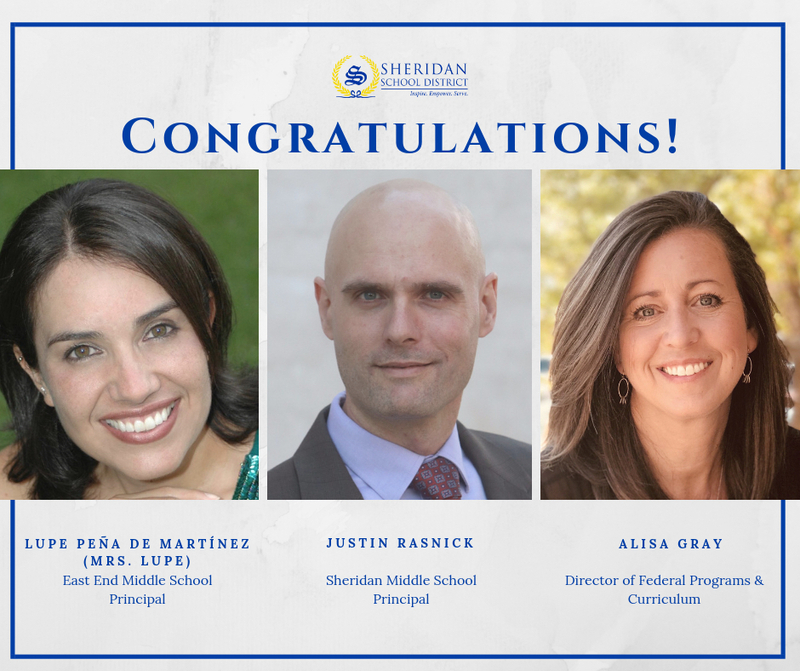 Sheridan School District is pleased to announce the new director of federal programs and curriculum, the Sheridan Middle School principal and the East End principal for the 2019-20 school year. Alisa Gray, the current SJHS principal, will be promoted to the director of federal programs and curriculum. She is replacing Susan Ridings, who will be retiring this school year after five years with the Sheridan School District and 37 total years in education. Mrs. Gray has been a part of the Sheridan School District since 1994 and has served as an elementary school teacher, district instructional coach, elementary school dean of students, junior high assistant principal and junior high principal. Her wide range of experience serving students from kindergarten through ninth grade in addition to her background as a National instructor for Cognitively Guided Instruction provide Mrs. Gray with a distinctly unique perspective on curriculum as well as the instructional services we offer to students through our use of state and federal funds. Justin Rasnick will replace Alisa Gray and serve as the Sheridan Middle School principal next school year. Mr. Rasnick is currently serving his second year as an assistant principal and administrator for the secondary level at the Arkansas School for the Blind. Mr. Rasnick began his tenure at the Arkansas School for the Blind in 2012, serving as a social studies and special education teacher for two years before accepting a position as the Special Education Supervisor for the district in 2014. He is described by his colleagues as being very well-spoken, personable and a reflective person of high character. In his previous roles, Mr. Rasnick has proven to be an effective instructional leader and has demonstrated the characteristics needed in order to create a school culture of continuous improvement in teaching and learning. Mr. Rasnick’s first day with the district will by Monday, April 1, 2019. Lupe Peña de Martínez (Mrs. Lupe) will serve as the principal for the new East End Middle School. Mrs. Lupe is currently in her second year as an assistant principal at Forest Park Elementary School in the Little Rock School District. She began her career with the Little Rock School District teaching at Chicot Elementary before moving to the Little Rock School District ESOL Department as an ESL/SIOP instructional specialist for the following 10 years. In these roles, Mrs. Lupe provided the district's faculty and staff with professional development, data analysis and technical assistance on compliance issues. Her colleagues describe her as a passionate educator with high expectations for all learners and a keen ability to build relationships. Mrs. Lupe’s first day with the district will be May 1, 2019.